We have just concluded out amazing fall 2017 season. And with that we’ve decided to show you all who was the champion of all of our regional tournaments! 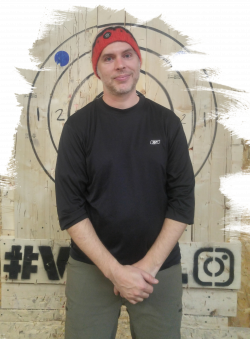 The axe throwing league participants vary from club to club and consist of young, old, female, male, athletic, not athletic. There is no previous skill or requirement for joining a league. Over the next few weeks we’ll highlighting the many winners of the regional tournaments at Bad Axe Throwing and those same people who went on to compete for the World Axe Throwing League’s World Championship! Without further ado, here is the Toronto champion for fall 2017! Abraham Lincoln because he would have reach advantage (token Fight Club rip off answer). I have no spleen, not sure if that is an axe throwing aid? The neighbours… Keep it Down already!!!! There you have him! The Toronto Champion! Make sure to check back over the next few weeks as we feature all the regional champions!